Peter H. Reynolds, creator of The Dot, has composed a pitch-perfect tribute to the power of music and the bonds of family. 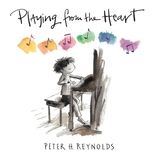 32 / 8 1/16" x 7 7/16"
Peter H. Reynolds is a New York Times best-selling illustrator who has created many acclaimed books for children. In addition to his Creatrilogy — The Dot, Ish, and Sky Color — he is the author-illustrator of Rose’s Garden, The North Star, So Few of Me, and The Smallest Gift of Christmas, as well as the illustrator of Megan McDonald’s Judy Moody and Stink series. Born in Canada, Peter H. Reynolds now lives in Dedham, Massachusetts.